As cellular carriers prepare to start customer trials of 5G networks, the rise of connected cars offers a new, premium market for these companies to offer different tiers of service and — depending on how much the customer pays — different speeds and experiences. GSMA Intelligence estimates that there will be 1.2 billion 5G connections by 2025. The new wireless standard would allow autonomous cars and industrial equipment to reliably exchange short bursts of data at blinding speeds. The near zero latency of 5G — praised by the industry as one of its main advantages — is critical for no-delay connectivity for connected and self-driving vehicles. 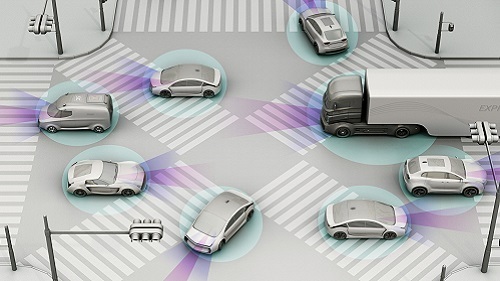 In order to keep critical services for autonomous and connected cars separate from regular consumer data, carriers are looking at a new concept in wireless networks — network slicing. It offers the ability to deliver multiple network occurrences over a single shared infrastructure, and deploy only the functions necessary to support particular customers and particular market segments. Network slicing takes the idea of network functionc virtualization (NFV) and applies it throughout cellular network architecture all the way to frequencies and services at cell sites. During Mobile World Congress (MWC) earlier this year, industry leaders and regulators discussed the concept of network slicing at length. With the recent repeal of net neutrality regulations by the Federal Communications Commission (FCC) in the US, operators are now looking to monetize their existing 4G LTE and upcoming 5G networks, offering different services, speeds and connectivity, at different price points. Network slicing is a key technology that will enable them to do that. During the show, Sprint CEO Marcelo Claure said he doesn’t see a problem with charging more for faster access to the network, comparing that sort of structure to toll roads. He said that with such a competitive market in the US, consumers will dictate how those prices move over time. “I don’t think there is anything wrong with charging more for a faster track for faster traffic … some customers are willing to pay more for faster service,” Claure argued. Sprint is planning deployments of 5G Massive Multiple-Input Multiple-Output (Massive MIMO) in Los Angeles, Chicago and Dallas before moving onto other cities. Instead of using Millimeter Wave (mmWave) hotspots, Sprint plans to layout the groundwork of 5G with thousands of access points using unlicensed 2.5GHz technology, escalating to tens of thousands by 2019. How will this affect the future of connected and autonomous vehicles? If net neutrality rules were in effect, meaning all traffic would be treated equally, carriers wouldn’t be able to charge premium prices for connected devices — this includes cars and other vehicles. Without the net neutrality protection, however, services such as vehicle-to-everything (V2X) and vehicle-to-vehicle (V2V), which require low latency and blazing speeds, could be charged at different rates than standard data packages. This could create not only a new digital divide for different users, but also a potential problem on V2V connectivity if not all vehicles are connected at the same speeds. Not only cellular carriers are looking to 5G and network slicing to increase their data revenue, they are investing heavily in connected cars, too. AT&T is already offering unlimited data plans — after 22GB of data usage, AT&T may slow speeds — on OnStar 4G LTE and for Ford’s SYNC Connect users. The carrier also has a connected car innovation center in Atlanta called AT&T Drive Studio. The latest figures show 17.8 million connected cars on its network. Verizon acquired Telogis, a developer of cloud-based telematics, in June 2016. Previously Verizon competed against Telogis with Verizon Telematics. Buying Telogis enables Verizon to profit from AT&T’s and Ford’s connected car businesses, since both companies are Telogis customers. When 5G networks are operational and new autonomous driving features become available, carriers will have the opportunity to slice the services at will to offer customized speeds, latency and critical connectivity to different users. It will be like having several tiers of cellular data, with the premium users not only getting the best speeds, but also the best experience. The total cost of ownership of a connected car could rise several thousand dollars if, in order to benefit from the most advanced features, users need to pay premium subscription packages to cellular carriers.